St. Thomas More's Primary School, Campbell , established by the Sisters of the Holy Faith in 1961, is a Catholic Archdiocesan School that follows the guidelines and policies set down by the Catholic Education Commission of the Archdiocese of Canberra and Goulburn. Being a small school, it is able to provide a special opportunity for children to develop in a friendly atmosphere where the needs and concerns of each individual are recognised and dealt with. As approximately 45% of our children come from Defence families, we are familiar with the problems they experience, and therefore endeavour to create a secure environment where all children grow in self-esteem and self-reliance. 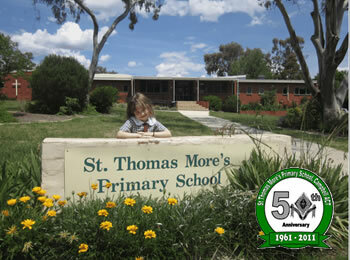 St. Thomas More's is a parish-based school consisting of classes for children from Kindergarten to Year Six. The class structures consist of single grade and multi-age class structures. St. Thomas More's Primary School community bases its decisions and actions on its belief that the school is a faith community promoting the values and teachings of Jesus Christ and the Catholic Church and providing an environment supportive of faith development.